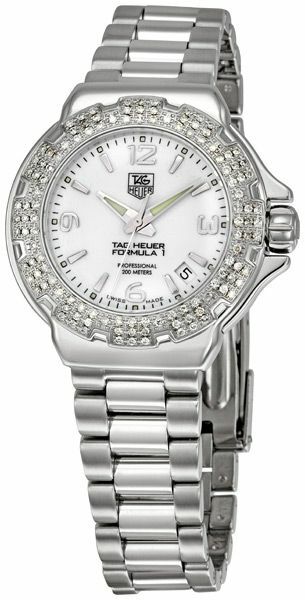 This gorgeous diamond, stainless steel ladies watch is perfect for the active woman. This watch comes equipped with a double-locking deployment clasp for extra safety while wearing during activities. This Tag Heuer Formula 1 Ladies Watch is also water-resistant for up to 660 feet / 200 meters! You can wear it while swimming. Tag Heuer likes to make their watches analog, which is what I tend to prefer. I think it gives the watch a classy look. The rotating diamond bezel definitely add to that elegant look as well. The silver colored hands and white dial really go well with the stainless steel and diamonds. While the case diameter and thickness is a bit large for most women’s watches, I believe this watch holds its own when it comes to style. I absolutely love the calendar date function on this watch –too often am I forgetting what the date is, and I can’t find my phone right away. I’m sure that anyone would find this feature to be of great convenience. This watch is made with sapphire crystal and a stainless steel bracelet. The Formula 1 Ladies Watch is really best for dressing up. However, due to its durability, it can be taken on vacation trips, to the pool, or other normal outings such as: trips to the grocery store, visiting with family, or even wearing it to work. I wouldn’t recommend wearing this watch while working out at the gym, as the size of the watch may get in the way of certain activities. This watch is listed at $2,700. Although this watch is quite expensive, it comes with a rotating dial full of 120 diamonds! You truly get what you pay for when you purchase this watch. Tag Heuer is a name you can trust.